How much does HULA give to charity? Which charities does HULA support? What is the 'GIVE' icon next to a product? Can I track my donations? Can I pre-select the charity and donation percentage per purchase or sale? Can HULA provide a receipt for donations? How does donation for charity work for 'top picks' featured on a Style Insider's page? HULA donates a minimum of 5% of its profits to its Partnered Charities. A 'GIVE' icon (heart in hand) next to a product means that the seller has decided to make a donation on top of HULA's 5% if the seller's item is sold. Buyers can make donations to our Partnered Charities at check-out by selecting a charity from the drop down list. The donation amount will then be added to the selling price. Sellers can make a donation on top of HULA's 5% by informing HULA of the percentage before HULA confirms that it will list a product for sale on the Website. If the product is sold, the donation amount will be taken from the payment HULA receives from the buyer. Of course there is absolutely no pressure to donate! If you wish to donate the entire proceeds of your designer clothing to a one of HULA's Partnered Charities, please contact us at Butler@theHula.com and we will be happy to help you make the necessary arrangements. If you are not shopping on the Website, but would still like to donate to one of HULA's Partnered Charities, please contact us at Hello@theHula.com and we will connect you with the charity you wish to support. Yes. To track your donations, go to My Account > My Details to see your donation history under My Purchases (for buyers) or My Sales (for Sellers). You must be signed in to use this service. Yes. Go to My Account > My Details > Preferences to pre-set the amount and charity for each purchase or sale. Once this is set, every time you check out, the percentage will be automatically added up with the final total (along with your chosen charity). Of course you may change the percentage and charity at check-out or reset it it back to zero should you decide not to donate. HULA transfers the donations to its PartneredCharities at least every 6 months. If you require a receipt for your donation, pleaselet us know and we will pass your request to the relevant charity. Please notethat you can only obtain the receipt after the charity has received the donatedamounts from HULA. Please email us at Hello@theHula.com for more information. Products chosen by Style Insiders as their favourites are showcased on their featured page as 'top picks'. 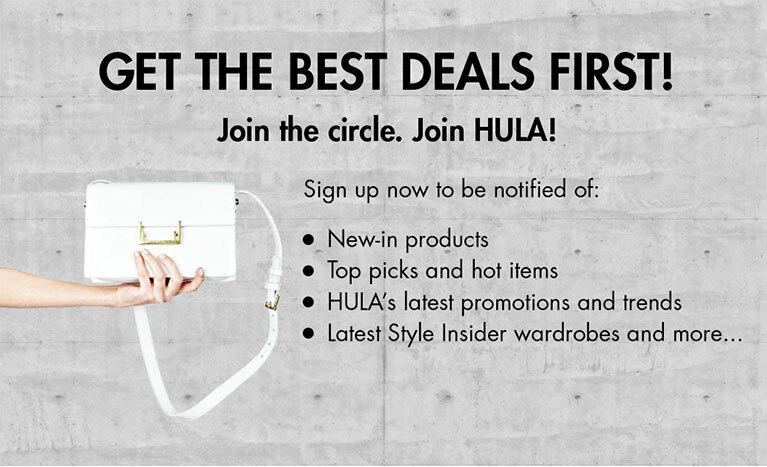 If a 'top pick' is sold, HULA will donate an increased percentage of its fee to the Style Insider's chosen Partnered Charity.